Oak Island NC This 12-mile stretch of barrier island just south of Southport is graced by live oaks and yaupon trees. 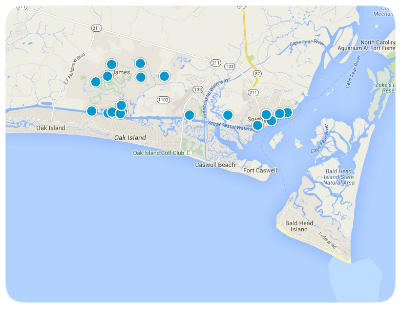 Oak Island boasts three piers and a marina to host all types of water related fun. 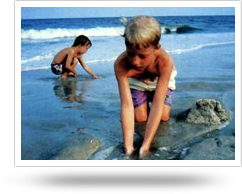 Uniquely situated along one of the "scalloped arcs" on the southeastern shore, Oak Island has a complex coastal ecosystem with areas of salt marsh, freshwater wetlands and maritime forests. The Island is home to a wide variety of flora and fauna. Special visitors include Atlantic sea turtles, which return every year to nest and lay eggs. In fact, the Town recently completed the Sea Turtle Habitat Restoration Project to care for the beloved residents! The island-the largest town in Brunswick County--has more than 5,000 residents, although those numbers swell to over 40,000 during peak season. 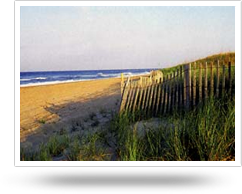 The Town, conscious of its attraction to visitors, offers 65 beach access points, a championship golf course and a nice variety of seafood and other restaurants. Caswell Beach NCHome to the once- brightest light house in the United States, Caswell Beach is named after the historic Fort Caswell located at the top of the island. The Fort, established by the Army in 1826, played a part in the Civil War, the Spanish-American War and the World Wars I and II. The fort is now owned by the North Carolina Baptist Assembly. The island is also home to the U.S. Coast Guard Search & Rescue Station. Island residents received a nice surprise in 2003, when the famed lighthouse was declared surplus by the U.S. Government and was deeded to the town. It will soon be open to the public, including five acres of oceanfront property. This quiet town (population 400) is largely residential and its lack of commercial development has helped preserve the marshes and deep dunes that surround the island. Here you'll find everything from oceanfront mansions to marshside cottages, with their great views of the mainland and Cape Fear River.